I wanted orange, and there could have been more orange. The center light color is a beige with a pink tone. Mostly, I love the overall look. Modern and bright. It is shedding profusely, especially where the door swings over it. I know, it's wool and that happens, hopefully, it stops. It does have lumps in it, or 'bubbles' so it's not laying flat. This is in the middle of the rug. I will try to steam it and hope for the best. Exciting colors, modern design and plush wool pile make this the perfect choice for any room. This beautiful floor covering features an abstract contemporary pattern in stylish colors like orange, rust, beige, sand, and gold. The rich warm colors will (hopefully) match my dÃ©cor. Wish there was a smaller rectangle to match. I bought a Soho Burst area rug a while ago that was beautiful, but the 'ribbons' keep pulling out. This rug has a similar look, but no ribbons to get yanked out with each vacuum. 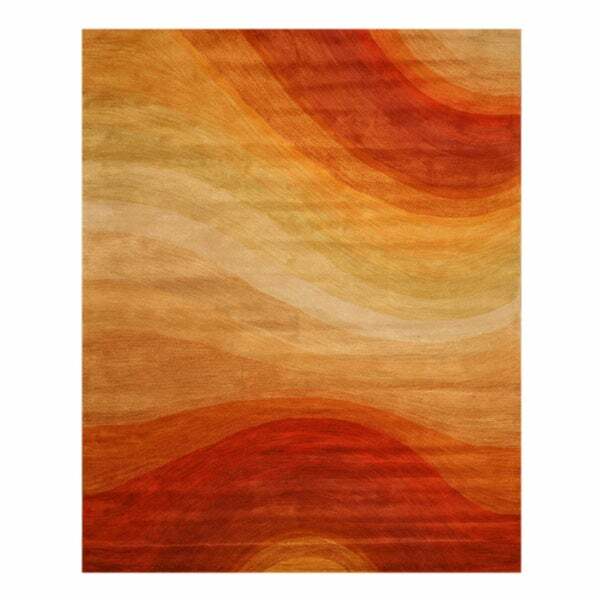 Safavieh Handmade Soho Burst Rust New Zealand Wool Rug - 7'6" x 9'6"